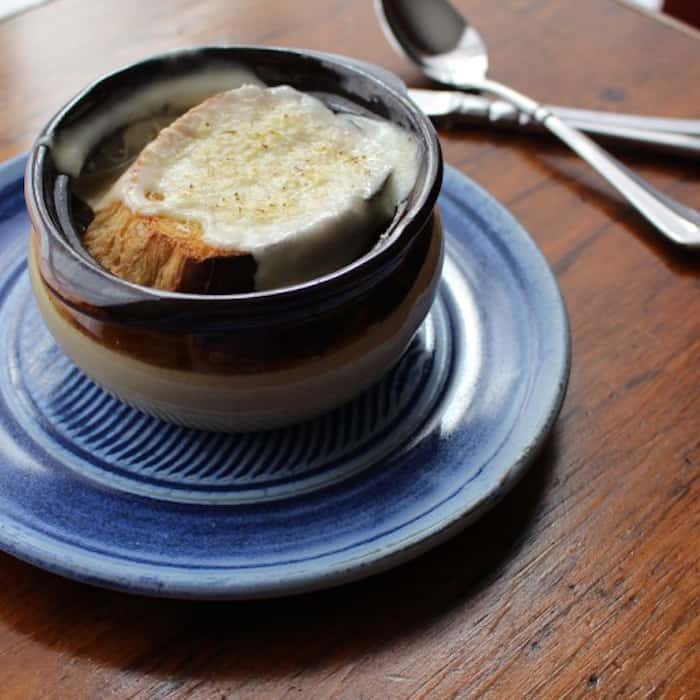 French Onion Soup, a comfort meal that is hearty and robust. Hi. It’s Lois in the kitchen at Recipe Idea Shop. 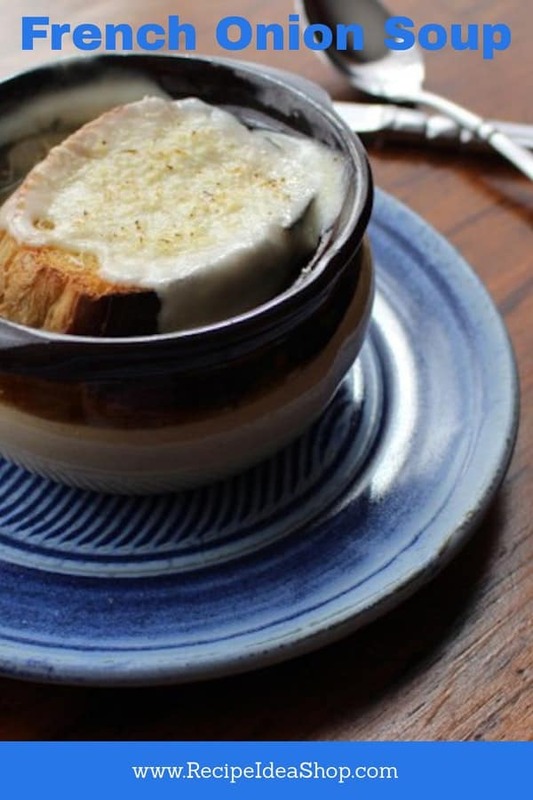 French Onion Soup is a delicious soup. Flavorful. Scrumptious. Great for a cold day. 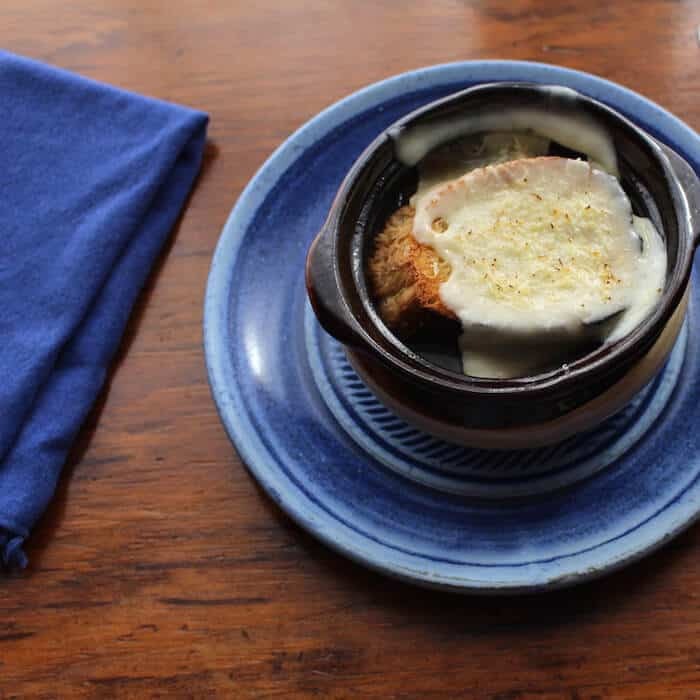 This is a rich, homemade soup topped with melted Swiss and Parmesan cheeses that can be eaten as a first course or an entreé. It is easy to make, and looks beautiful. One of my friends was looking for a French Onion Soup recipe recently and I suggested this one. She posted on Facebook and said she was going to make it and included a link. When someone asked her how it turned out, she said, “Not good.” I was shocked and distressed! This is a terrific recipe. My reaction was to think that I had not written the recipe correctly. (And therefore, it’s my fault.) But when I told Don about it, he said, “I wonder what she did wrong?” Hmmmm. A very different take on one simple comment! Later, when I checked with my friend, she said that she had burned the toast and wasn’t sure the bowls were ovenproof, so melting the cheese was a problem. Whew! I’m so glad it wasn’t a problem with my recipe. We have made this French Onion Soup recipe numerous times, and it is always delicious. And my friend made it again and let me know she loved it. I was so relieved! Thinly slice onions and saluté in butter until soft (or if you like them more robust, let them caramelize). I use my food processor to slice the onions. French onion soup, almost done! French Onion Soup, ready to eat. This recipe comes from Betty Crocker’s International Cookbook, one of my favorite cookbooks. Serve with additional French bread and a salad and it makes a delicious evening meal. Calphalon Classic Nonstick Dutch Oven with Cover, 7 quart, Grey. Calphalon is a good brand. Buy it on Amazon today. And some good ovenproof Soup Bowls are very helpful for making this soup (you can use them for Chili too)! We have bowls like this and love them! Onion Soup Bowls with Lids. Buy on Amazon today. 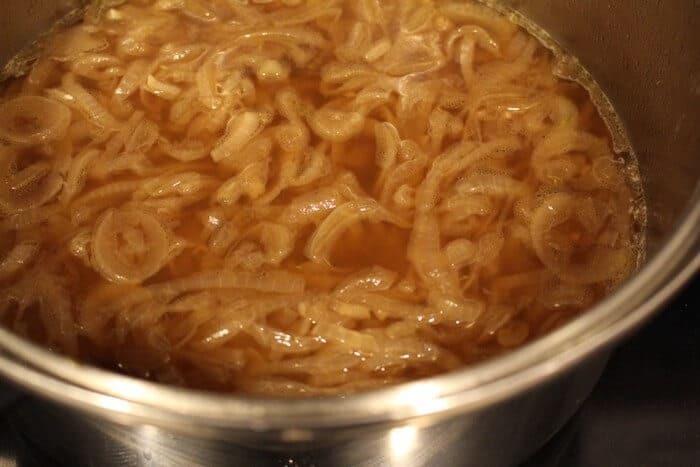 If you are not keen on standing at the stove to make caramelized onions, but you want a hearty French Onion Soup, start with instruction #2 and use the onions you make ahead in Slow Cooker Caramelized Onions. 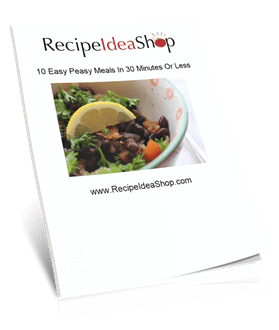 It will take you about 20-30 minutes to finish up the recipe and sit down to supper. A hearty soup, rustic and delicious. 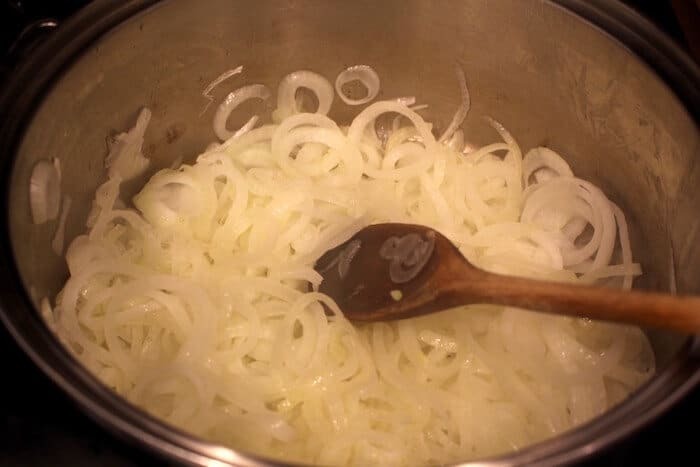 Cook onions in oil (or butter) in a 3-quart saucepan, covered, over medium heat for about 15 minutes until the onions are tender. Add broth, water, bay leaf, pepper and thyme. Place bread slices on a cookie sheet and broil about 1 minute until golden brown. Turn, broil the opposite side until golden brown. Or, you can simply toast them. Place bread in the bottom of 4 oven-proof bowls. Add broth. Top with Swiss cheese, then sprinkle with Parmesan or Pecorino Romano cheese. 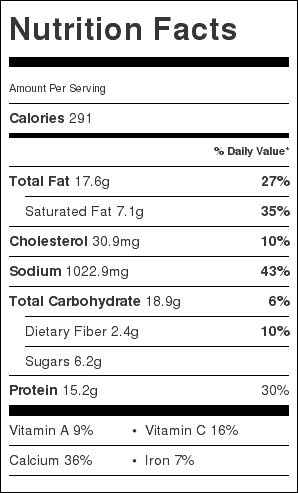 French Onion Soup Nutrition Label. Each serving is about 1 cup. This time I followed the directions! And it came out superbly. 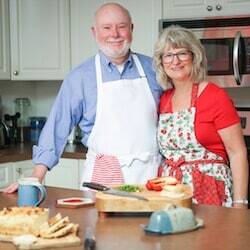 As a matter of fact, since my husband and I had a heavy lunch around 2:30 pm, a bowl of this soup on Sunday night was quite satisfying. Luanne, I’m so glad you liked it. I’m thinking about making it soon, too.